There are many agonizing decisions that need to be made regarding the end of life treatments for a loved one. Whether or not to administer forced artificial hydration and nutrition is often one of those hard decisions. While it may sound like an obvious choice to provide sustenance to your loved one, many medical professionals believe it may cause more harm than good. So what’s the alternative? As written in the article “How Fluid Deprivation Affects the Terminally Ill” by Paul C. Rousseau, M.D., dehydration is not painful for the patient with studies showing that it is, in fact, beneficial. 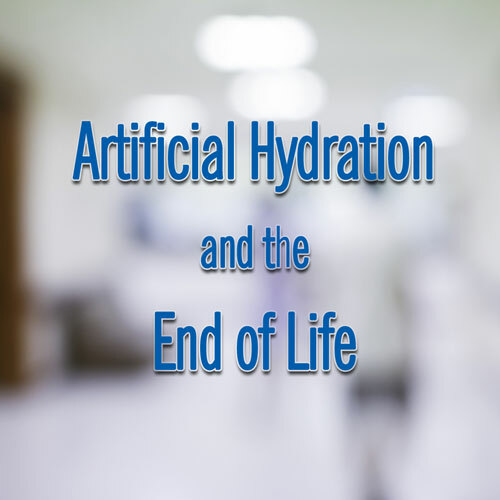 As death approaches, dehydration occurs naturally from inadequate oral intake, gastrointestinal and renal losses, and the loss of secretions from the skin and lungs. Transitory thirst, dry mouth and changes in mental status develop, but the headache, nausea, vomiting or cramps usually associated with water deprivation rarely occur. The mental changes, while upsetting to relatives, bring relief to the patient by lessening their awareness of suffering. This effect is caused by caloric deprivation stimulating the production of ketones. One drawback of dehydration is oral discomfort. To ease discomfort, saliva substitutes like moisturizers should be used along with frequent rinses with non-alcoholic mouthwashes, ice-chips and lip balms to soothe dry lips. If it is decided that artificial nutrition bears more risks than benefits, love and nurturing can be expressed in other ways. A loving touch, gentle words, keeping their mouth, skin and lips moisturized and bringing beauty and warmth to the room can bring comfort to your loved one during the final stage of life. Sometimes the mere presence of family and friends can bring much comfort to the patient even if he/she is seemingly unaware. This article was posted in Hospice Care.